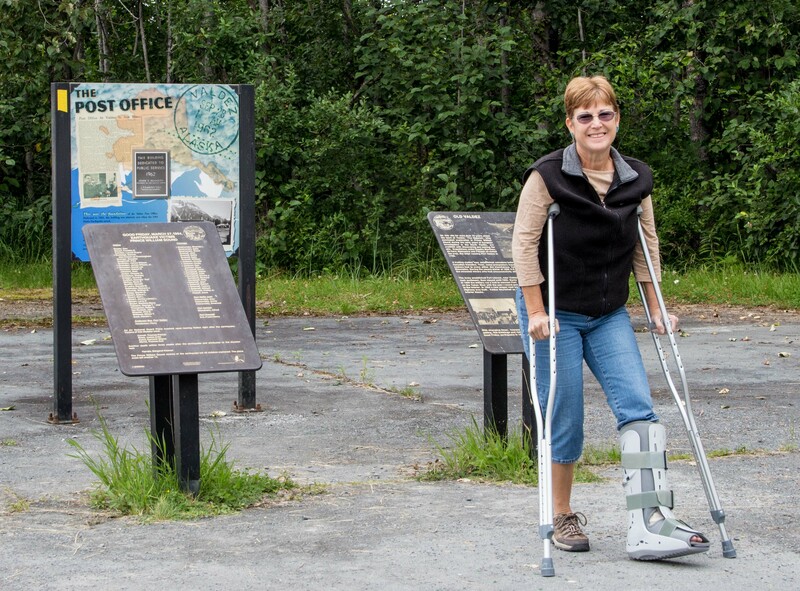 As many of you know, Dianne suffered a broken leg at a campground near Anchorage. We found a top notch orthopedic and got her patched up but she is dealing with many follow-up appointments and a long recovery. It definitely changed our plans. In between appointments, our first venture post accident was to Valdez. Valdez has everything you come to see in Alaska – all in one place. 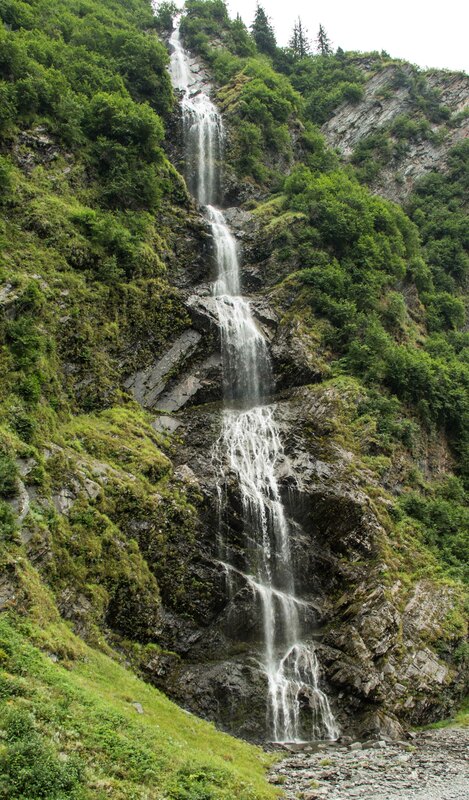 Located on the south coast on Prince William Sound, Valdez has wildlife, glaciers, mountains, fishing, history and adventure. 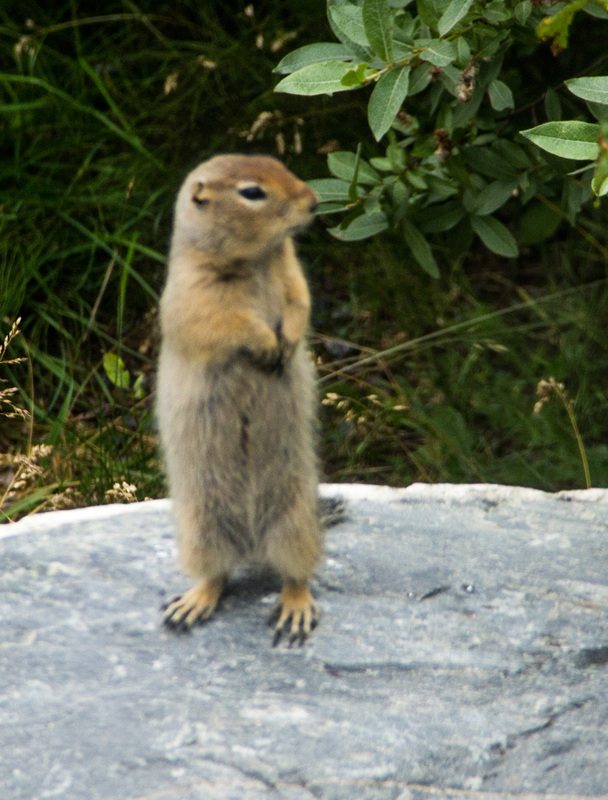 Wildlife includes black bears, brown (grizzly) bears, eagles, terns, ptarmigan, puffins, whales, orcas, porpoise, seals, sea lions, and otters. 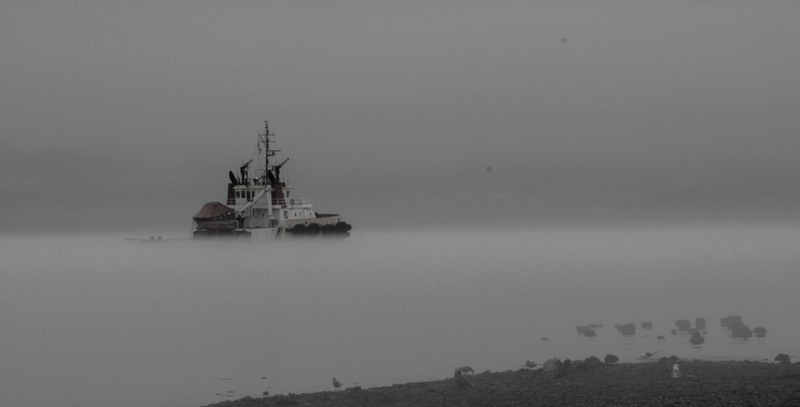 The scenery around Valdez is spectacular. 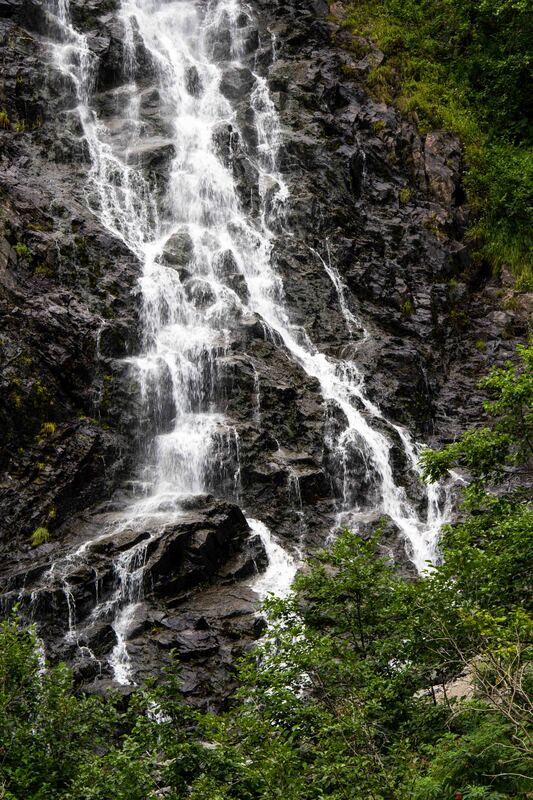 The drive into town on the Richardson Highway takes you through Keystone Canyon with its countless waterfalls. The mountains surrounding it include 9 of the 16 tallest in North America. The nearby Columbia Glacier is the second largest tidewater glacier. The icefield in nearby Wrangell-St. Elias National Park is the largest non polar ice field on earth. Fishing is a big deal in Valdez. There are fishing derbys all Summer. 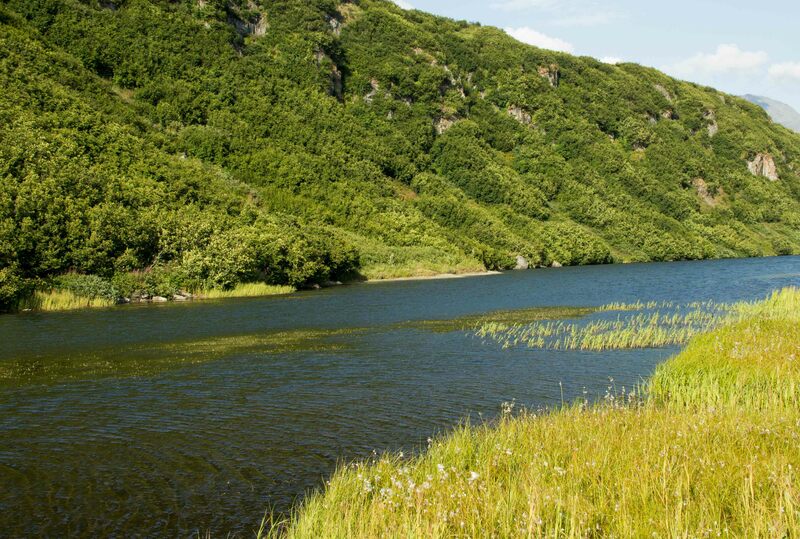 The local salmon fishery has a set goal of 10 million returning pink salmon each year, along with 10,000 silvers and 1000 kings. Halibut fishing is popular. The forest service protects a very small stream where visitors can watch pink salmon struggling upstream in their quest to spawn. The stream so shallow many times their backs are completely out of the water. The fish are so close you could reach out and grab them. The stream is so short the sea is just 100 yards away. Yet they battle to reach that gravel bed where they were born, there to lay eggs in the gravel and die. This scenario is played out all over Alaska often on a much grander scale. Some salmon swim up the Yukon River over 2800 KM to spawn and die. And of course they don’t eat anything along the way. Theirs is a single minded pursuit. It is amazing to see. 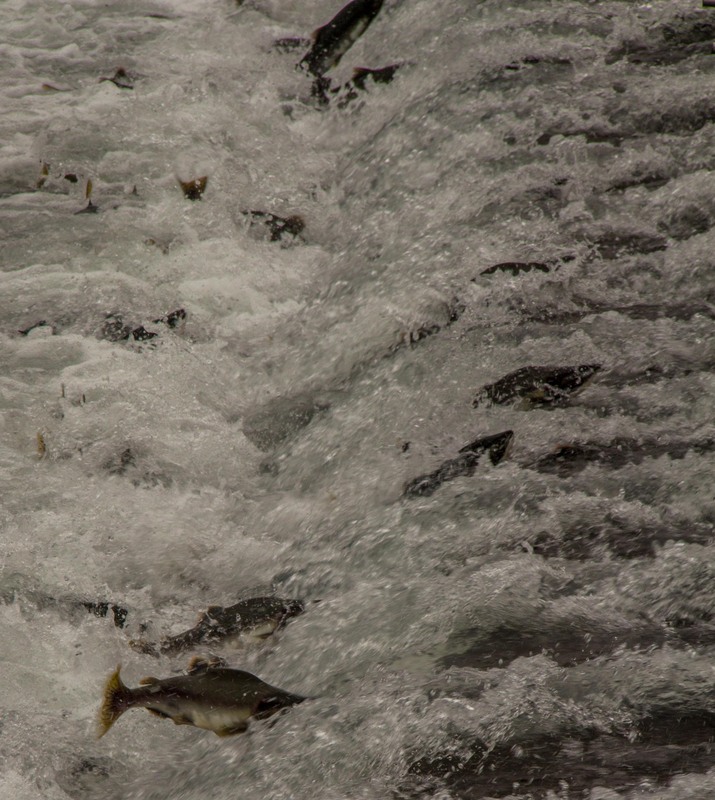 Alaska hatcheries add to the salmon numbers releasing millions of smolts each year. And then each year millions of salmon try to find their birthplace to spawn only to be harvested by anglers or the hatcheries or bears or eagles. The history of Valdez is marked by 2 major events. The 9.2 earthquake of March 1964 and the Exxon Valdez oil spill of 1989. The earthquake is the strongest in the recorded history of North America. The tsunami from the quake did major damage to Crescent City California. The town of Valdez was heavily damaged, 33 people died. After the quake the townsite was found to be unstable and the entire town had to move to a new location nearby. The old townsite is marked with plaques as nature takes it back. We all remember the devastation of the oil spill when the Exxon Valdez ran aground. Prince William Sound is one of the most pristine ecosystems on earth. The spill should never be forgotten. The trans Alaska oil pipeline ends in Valdez and still operates today. 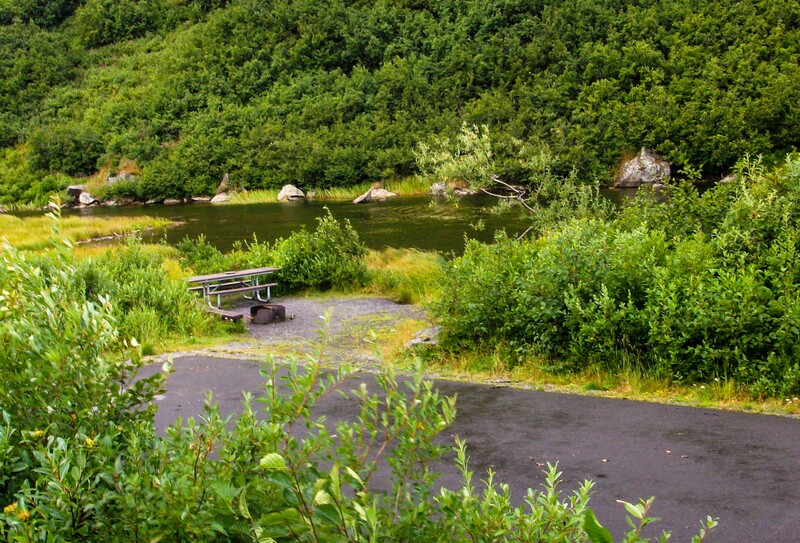 We stayed in a beautiful Alaska State Park, Blueberry Lake. Our site was right on the lake surrounded by mountains. 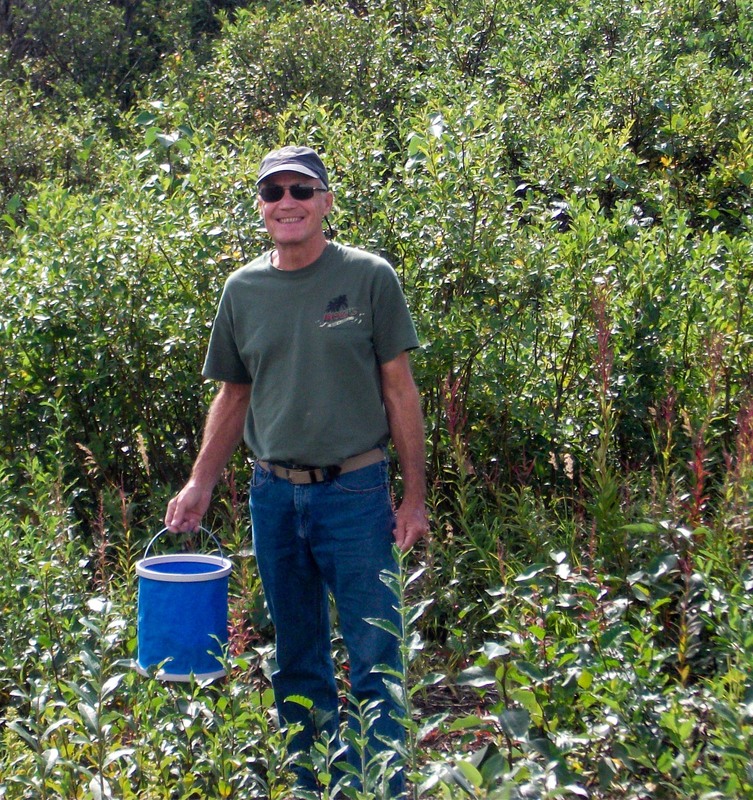 Blueberry picking was great and is a popular Alaskan outdoor activity. You just have to watch for bears, its their favorite food. 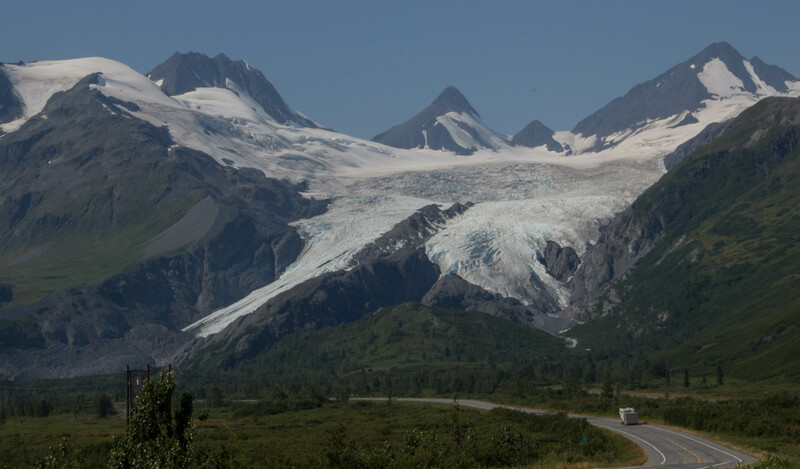 This entry was posted in Alaska, RV, RV Travel. Bookmark the permalink. So glad to see that Dianne is healing! I send my best wishes to her for a complete recovery! These photos are wonderful and I love feeling like I’m on your adventure with you! Be safe as you continue your journey south! Hugs! Gorgeous photos of an incredible landscape; Dianne included. You both look great, even with Dianne’s setback. Still enjoying life. 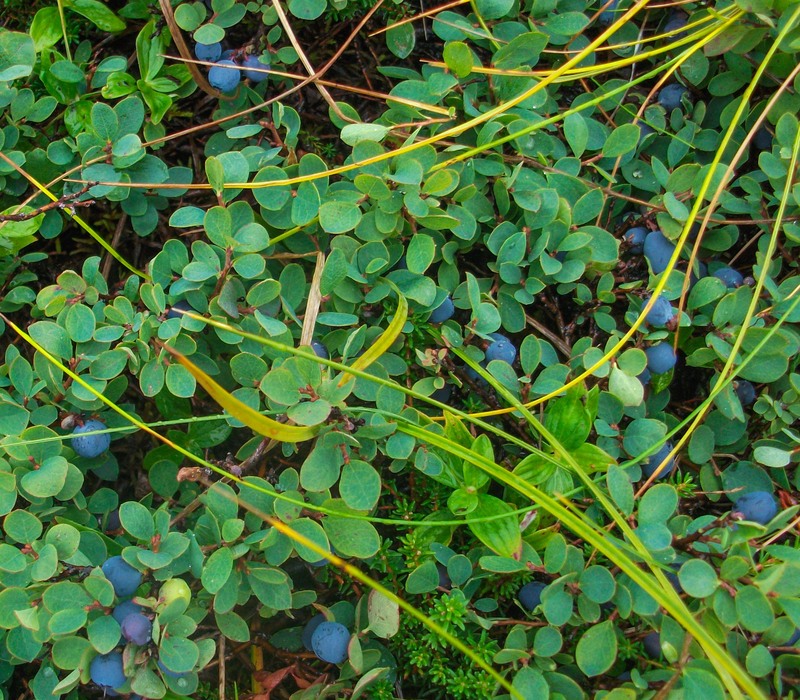 Did the blueberries get eaten before a pie could be made? Thanks Lynne. Today we made cranberry (also wild from Denali) walnut scones and wild blueberry muffins. We’ll be eating good on the road again. Big surprise! Fun to see your sights and hear about your travels. Alaska’s Valdez sounds pretty amazing – don’t think we made it there, but did really enjoy our experience in Alaska too. 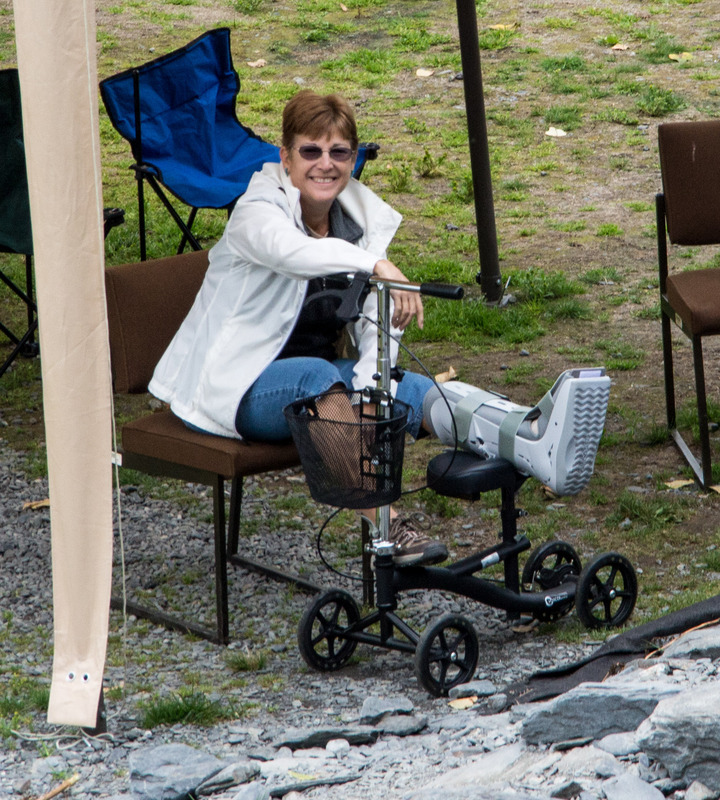 Diane, that looks like quite a leg boot cast. Hope it’s heals quickly. Yes, she is pretty impressive with her giant aircast. Getting good at crutches too. Every day is just a little better. We’re closer to the end than the beginning. Alaska is pretty amazing all around and seeing it by RV is the way to go.